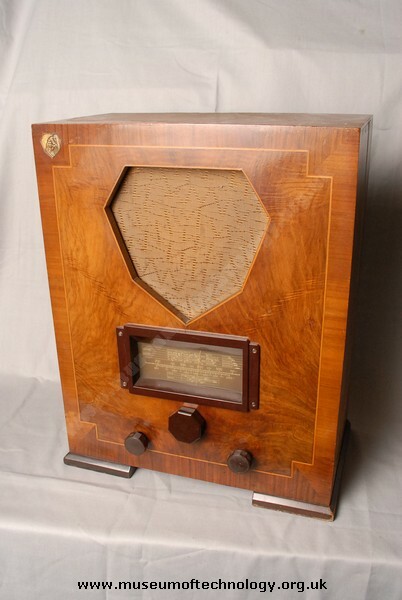 The Mullard MA3 was manufactured in 1935. From the mid 20's till 1938 Mullard was more or less owned by Philips. A fact which was little known by the public, Philips models were labelled and sold as Mullard products, often with different cases. It is a four valve 2-band TRF receiver with two alternative Arial sockets to the rear these were used if the set was too close to the Droitwich transmitter, these are marked "A2" and "D", the former being a simple condenser and the later a rejection circuit for Droitwich. The valves used are VP4A - SP4 - PEN4B and IW3. Original price not found. My parents owned this model when I was a child. I would sit by the wireless at 1.45pm ready for 'Listen with Mother'. Sometimes I would be alowed to switch it on. The lower knob on the left would achieve this by two turns (I think) the first for MW, & the second for LW on which could be found the Light Programme. My mother was an avid listener to Mrs Dales Diary & we listened to the Coronation on this set.